Does Jumping on a Trampoline Help You Grow Taller? » Does Jumping on a Trampoline Help You Grow Taller? No matter how much some of us dislike exercising, there are plenty of benefits to it. A healthy body weight, more flexibility, even growing at a reasonable rate — these are all the things proper workouts can give us. However, when it comes to increasing our height, genetics play a big part in it. If our parents are rather short, and all our other relatives weren’t that tall either, then there’s little we can do about it. 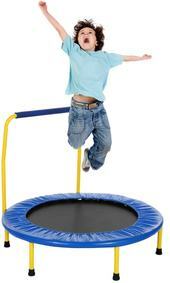 Still, some research has shown that jumping on a trampoline can help us grow taller. And, given the fact that using a trampoline, in general, offers many benefits, we just had to look into this and figure out an answer to one of our burning questions: does using a trampoline help increase height? Does using a trampoline increase height? Short answer — yes! In essence, trampolines are fantastic if we want to incorporate a low impact workout into our daily routine. Since we ought to jump on them, our body will naturally stretch with each jump, which can actually help us grow a bit taller. It’s sort of like yoga, but instead of stretching on a mat, we’re jumping all the time. Moreover, it’s similar to playing basketball. There’s a reason why basketball players are the tallest people in the sports industry. They’re always jumping and stretching their backs, trying to make the shot. By doing so, they’re allowing their bones to grow just a bit with each jump. That leads to them growing taller than most people. The best part about using trampolines on a regular basis is that they won’t hurt our bones at all. In fact, jumping can actually prevent bone diseases such as osteoporosis and chronic arthritis. Of course, since trampolines include a lot of jumping and stretching of our backs, arms, and legs, we’re bound to lose weight if we use one regularly. That too can add to the appearance of us looking a bit taller than usual. Moreover, since we’ll be stretching a lot, our backs will get used to that and actually straighten up a bit. That way, we’ll grow a few inches just by having good posture. How to use a trampoline to increase height? 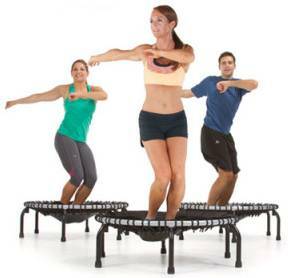 Still, just like with regular workouts, we ought to use the trampoline the right way. If we want to grow a bit taller with it, we’ll need to incorporate some moves and use our jumping time as efficiently as possible. One of the most important things about growing taller is always moving our body. If we tend to just sit on a trampoline and bounce, we won’t get tall. In fact, that could have an entirely different effect, as we tend to slouch a lot more while we’re sitting. We can just jump up and down, but the effect will be much better if we lift the opposite leg whenever we’re jumping. For each jump, we ought to lift the leg as high as possible. Once we master this move, we can move on to air kicks. While jumping on one leg, we ought to kick the air with our other leg. That way, we’ll get a nice stretch, and our bones will elongate a bit. One of the things we need to pay attention to while jumping on the trampoline is that our arms should be up in the air. No need to keep them next to our body, as that won’t do much for our height and our back. In order to get a good stretch and elongate our whole body, we ought to raise our arms whenever we jump. Think of it as imaginary apple picking. Each jump allows us to touch the highest branches on the tree. So by reaching high, we’ll get the most (imaginary) apples. We should eat lots of fruits and vegetables, which we will need in order to grow healthy bones and avoid packing on the pounds. Water is another important ingredient here, as we need to hydrate in order to get rid of toxins on a regular basis. About two liters of water per day should be enough. For example, if our children are still small, then we need to make sure they are taking enough vitamins so that they can grow taller. Calcium is the magical mineral here, as it directly influences how much a person grows over the years. Of course, if we’re adults, we cannot hope for any huge growth spurts. But using a trampoline can still help us stand up straight and straighten our backs, which may allow us to grow a bit taller in a short amount of time.